We confront the gusting winds and broiling heat of Belize archaeology while working in the plowed fields that expose some of the remains of this ancient Maya settlement (see previous blog post), but our field days begin much calmer – with a warm breakfast made for us by Miss Louisa, Valley of Peace Archaeology project foreman Cleofo’s wife. Afterward, as the satisfied crew pulls away from the Valley of Peace village, we prepare to separate into two groups. 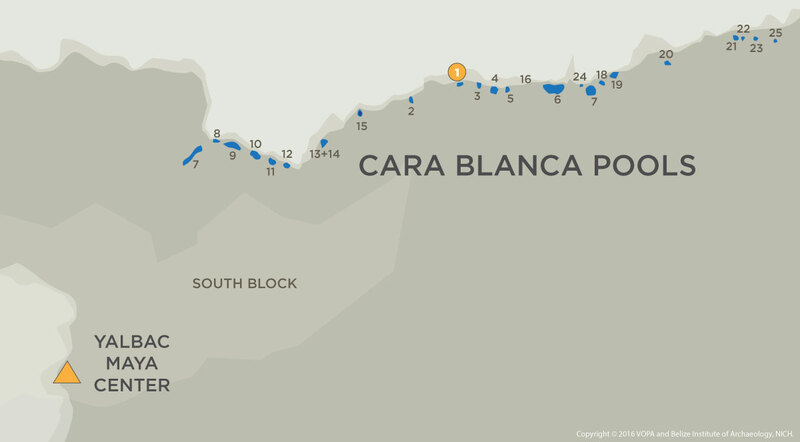 Some will go to back out to the open agricultural fields, and the others enter a much different archaeological context, the Cara Blanca Pools. 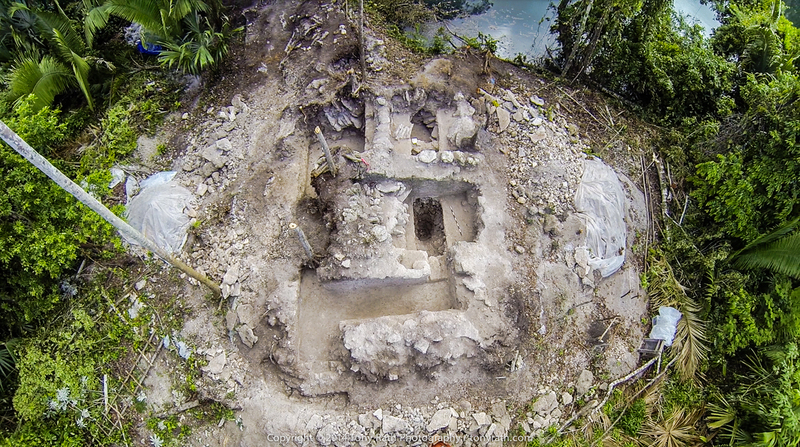 Cara Blanca, Belize, hosts more than two dozen pools used by the Maya. The team focuses their efforts on a temple at Pool 1. 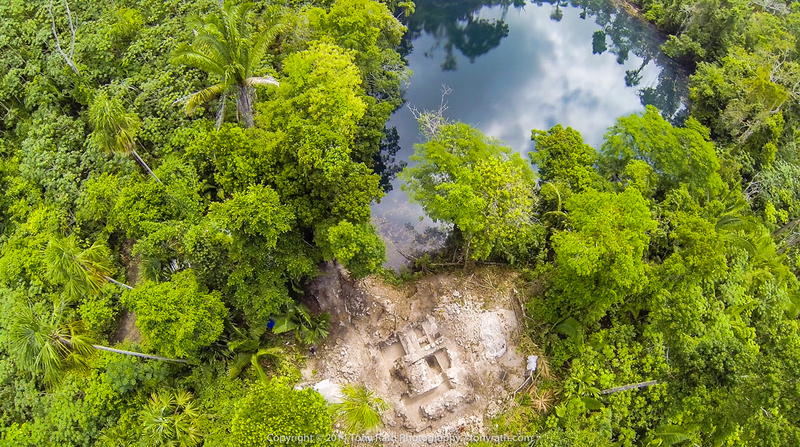 The view of Pool 1 from a ceremonial platform used by the ancient Maya. 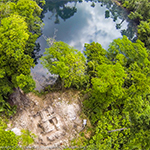 The ancient Maya believed that cenotes, like caves, were portals to the underworld where Chahk the rain god resides. Just 20 meters to the east of the water temple is a ritually potent platform. This sacred space was visited during the Terminal Classic droughts that struck the Maya area, 800-900 A.D. Here, Maya proffered goods to Chahk and ancestors in search of reprieve from the aridity. We know that the Maya burned and smashed hundreds of ceramic vessels, and then covered it all with large boulders to “deanimate” it, necessary in a world where everything was animated. 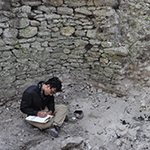 This year, we hope to expose the entire structure with our excavations, but it continues to defy our expectations. The sacred space holds secrets that we might never fully comprehend. 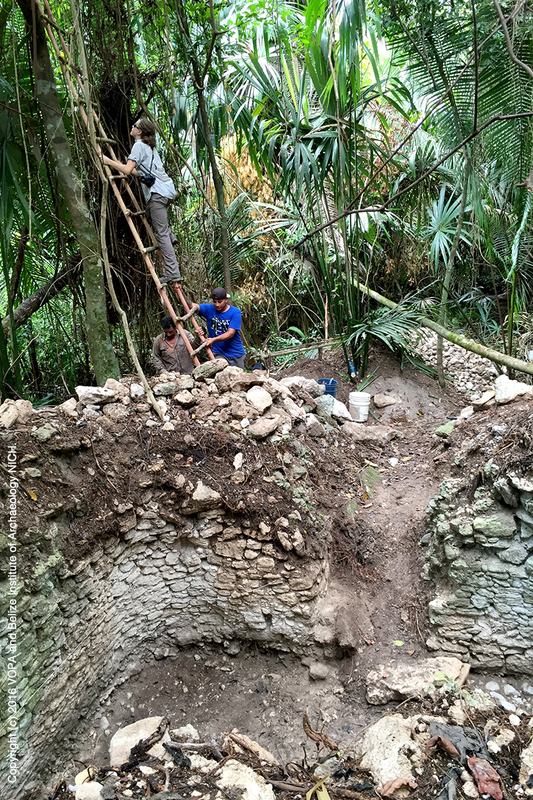 A 10-minute walk to the west, another team of field school students and field assistants maps an ancient sweatbath. Though looters and a 2010 hurricane caused serious structural and interior damage to this structure, we can see the rounded corners and domed roof that emphasize the unique nature of this building. Orientation of the temple at Pool 1 and a nearby structure containing a sweatbath. 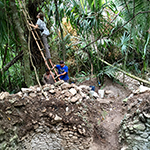 Anthropology professor Lisa Lucero and her team are mapping, excavating and exploring both structures. 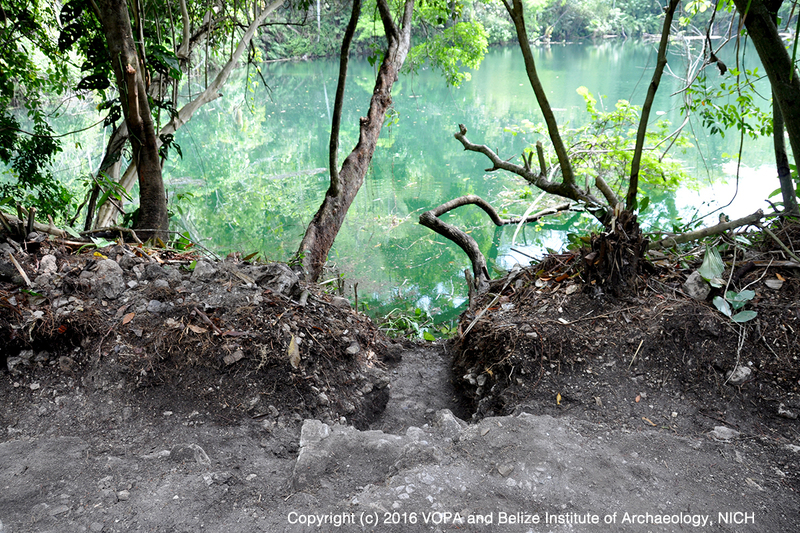 We are saving the first images of this structure for the annual Belize Archaeology and Anthropology Symposium at the end of June. Because looters dug through almost all of the floors and removed most of the artifacts, mapping what remains is essential. By drawing the exposed architecture, we can identify plaster floors and cut limestone walls and imagine its layout as it existed over a millennium ago. So, as we swat away doctor flies (nasty and persistent creatures) and give our own sweat to the naturally stuffy space of this ancient Maya sweatbath, we meticulously measure each cut stone and floor, attempting to visually reconstruct the space where the Maya likely ritually purified themselves before they visited the nearby water temple and, perhaps, other ceremonial places around the 25 pools of Cara Blanca. 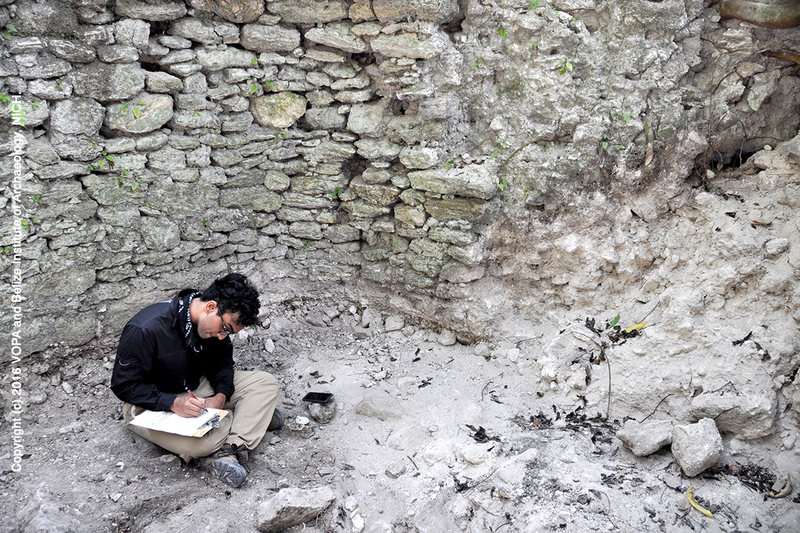 Field school student Anuj Amin draws a profile of the sweatbath. Each of these spaces and their ancient uses provides fractured bits of insight into the ways in which people in the past confronted their changing climate. Our goal is to reconstruct these bits into a more complete understanding of sustainability in the past to inform our future. Jeannie Larmon climbs a ladder to photograph the sweatbath. Each day offers new challenges – including navigating roads torn apart by the afternoon rains, which are slowly beginning to limit our time in the field – and new excitement, like the lunchtime visit from a fox that gazed at us from only meters away. Some days, to recover from the heat, we stop at Tres Estrellas, VOPA foreman Ernesto’s bar in the Valley of Peace village, before making our way back to our home away from home, Banana Bank Lodge. We don’t have much time before we have to go over the next day’s plans. And now we only have less than two weeks in the field and lab; we will let you know how it all ties together in the next blog! An aerial view of Pool 1 and the associated temple structure.